Glass mosaics will spice up the décor and create an artistic masterpiece wherever they’re used. All but the darkest mosaic tiles will reflect light rather than absorb it and create a glow you won’t find in other materials. Glass mosaics will become the center of every conversation. They’re chosen not only for their bold and splashy colors but because they provide endless design opportunities. Few glass mosaics are as colorful as the spectacular wall art created with Glacier Moon Metallic Black. Translucent glass gems are the centerpiece of the Glacier Metallic series. Metallic Black tiles are lavish and luminous and add a sophisticated flair to a contemporary master bath. Glacier Moon Metallic White or Metallic Cremas are two elegant options if you prefer a lighter mosaic. You’ll be inspired to create a masterpiece in your own room when you see the astonishing beauty of the Glacier glass mosaics. 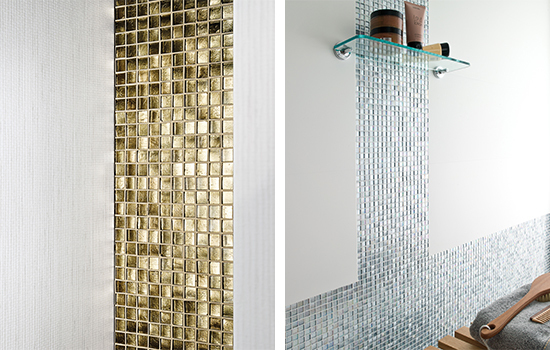 Glass mosaics can also be designed as small sections within a wall. The gorgeous tiles pictured here are Arabia Gold and Arabia Silver; both have been installed in the midst of large-format wall tiles and add an element of surprise to a master bath. Arabia Silver creates a waterfall-like effect and when highlighted by natural lighting, glass mosaics are even more dramatic. Due to their flexibility, glass mosaics are even tough enough to be used near a fireplace. Their durability allows for many styles to be used in an outdoor kitchen, to decorate an outside porch, or create a beautiful fountain in the yard. Creating simple, repeating or complex patterns is a snap with glass mosaics as they readily conform to each space. Take a look at Porcelanosa’s “Glaze” collection with its unique line of shapes: dots, bricks, hexagons, bottles, rhombus are standouts. 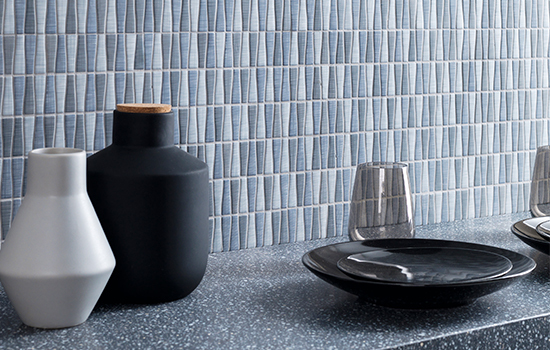 Glaze even boasts attractive mini and micro glass mosaics. Glaze Denim Bottle Light offers a splendid rendition of vintage bottles in a repeating pattern. Choosing a tile in a shape other than a square adds pizazz to the décor. If your preference is toward a darker shade, consider Glaze Denim Bottle Dark and you’ll be impressed with the effect it creates in your room. Take a look at the inimitable Glaze Wave Turquoise. 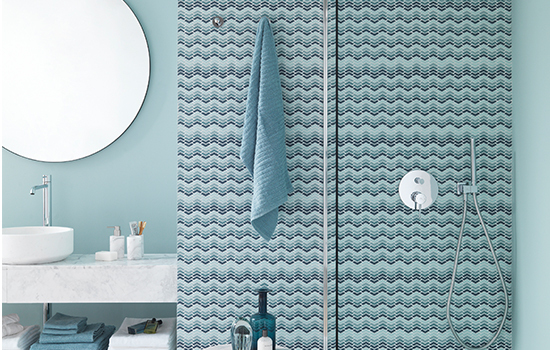 The gorgeous pattern of waves coupled with the color variations in this glass mosaic are stunning. 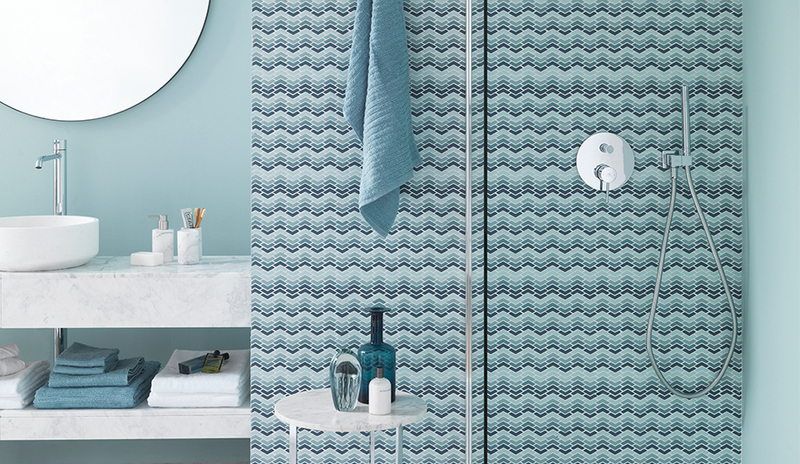 Choose Glaze Wave Blue or Glaze Wave Green for an entire wall, an accent wall, or inside the shower to create a calming, relaxing feeling. Blend it with similar colors for a calming look or add a splash of boldness with reds, oranges or violets. Hexagon-shaped tiles add class and elegance to every room. A lighter colored design can be achieved with Glaze Hexagon Beiges Matt. The unique effects created by the honeycombed mosaic when blended with a wood-look porcelain tile as shown here are unquestionably breathtaking. 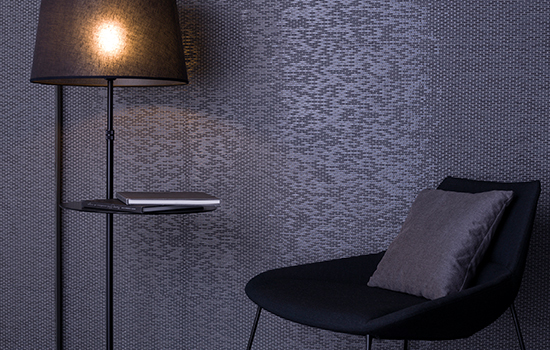 Consider creating a darker effect with Glaze Micro Brick Grey. The shine reflected by glass mosaics creates an open and airy feeling as light bounces around the design. You don’t often see mosaics quite as small as these and the effect they create is outstanding. Glass mosaics are easy to clean with a damp cloth and are resistant to stains, mold and mildew. Though glass mosaics are often appropriate for flooring projects, they can be slippery and are susceptible to scratches so generally we recommend glass mosaics for wall projects. Whether you desire bold, splashy, simple or understated colors, choosing the right type of glass mosaics for your décor is a must. Need help with your selection? Visit any of our Porcelanosa showrooms and work with our in-house design consultants who will help you select the perfect mosaic for your project.